Why did my Windows VM suddenly lose network connectivity? There is a known connectivity issue with e1000 or e1000e network adapters that affects Windows Server 2012, Windows Server 2016, and Windows 10 VMs. The network adapter may lose connectivity after working correctly for days. To check which network adapter type your VM uses, from the VM tile, click to display the VM Settings > Network Adapters page. Temporary – Reboot the Windows guest OS. Permanent – Replace the e1000 or e1000e network adapter with a different network adapter type. Note any custom network settings that are applied to the network adapter, either in Skytap or within the guest OS. 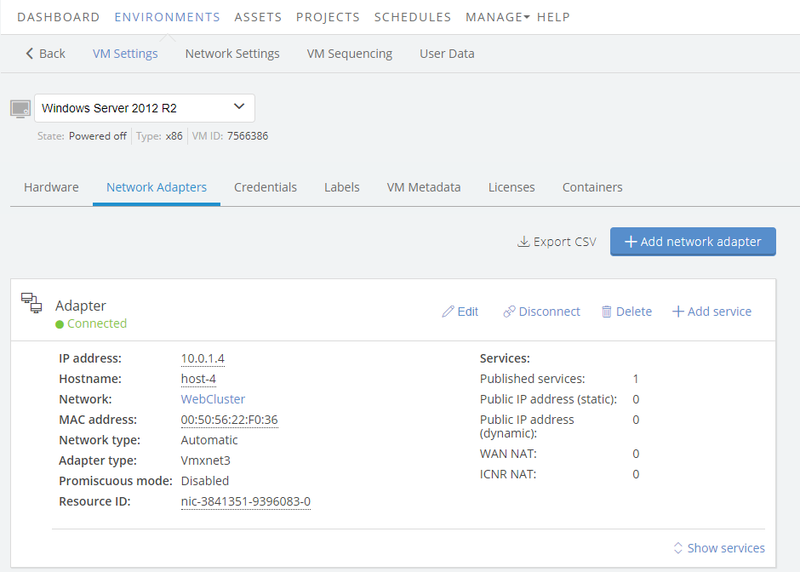 On the VM tile, click to display the VM Settings > Network Adapters page. For the e1000 or e1000e network adapter, click Remove Network Adapter. Click Add Network Adapter. The Add network adapter dialog displays. In the Network adapter type dropdown menu, choose a different network adapter type, such as Vmxnet3. Re-apply any custom network settings that you noted in Step 1.